If you already have all of your Christmas gifts bought and wrapped, hats off to you! I hope to be like you someday when I grow up. Lol. 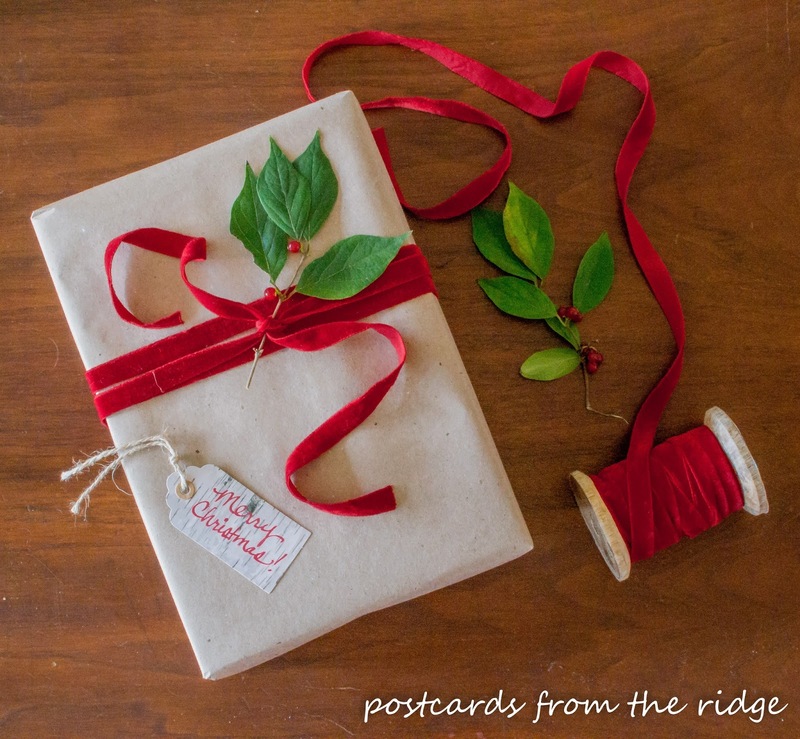 If not, and you're like me and still have to find and wrap those wonderful gifts, then you might be inspired by today's post. Several of my very talented blog friends and I have teamed up to bring you some creative gift wrapping ideas. Some are too pretty to open! 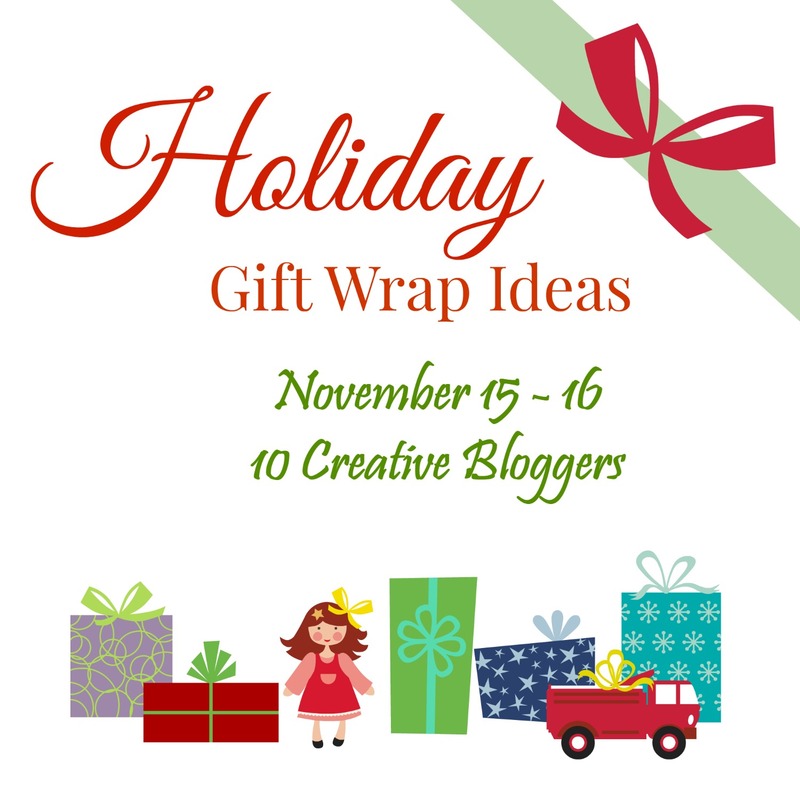 There are 10 of us sharing ideas for gift wrapping. 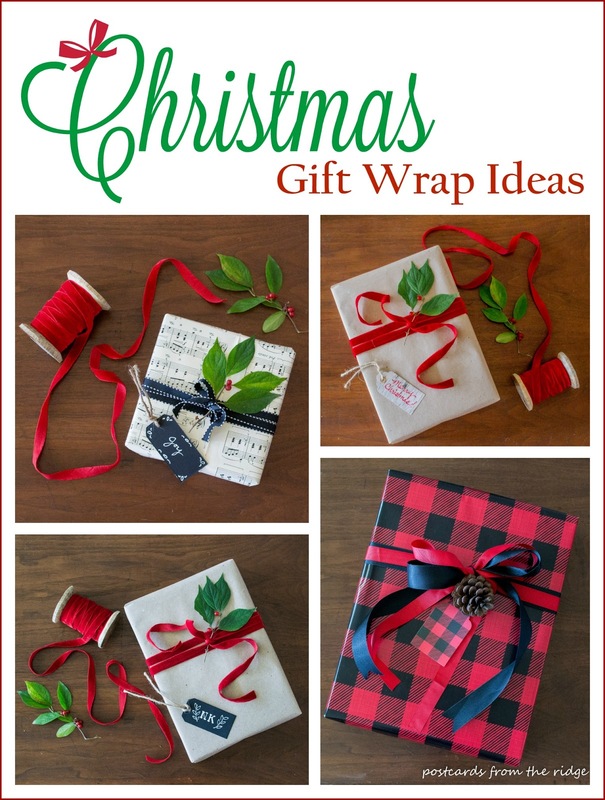 Be sure to visit the blogs listed at the bottom of the post to see their clever gift wrap ideas. For my gifts, I used kraft paper, an old book of sheet music, chalkboard wrapping paper, and super trendy buffalo check wrapping paper. I embellished them with velvet ribbon and some small branches snipped from the back yard. 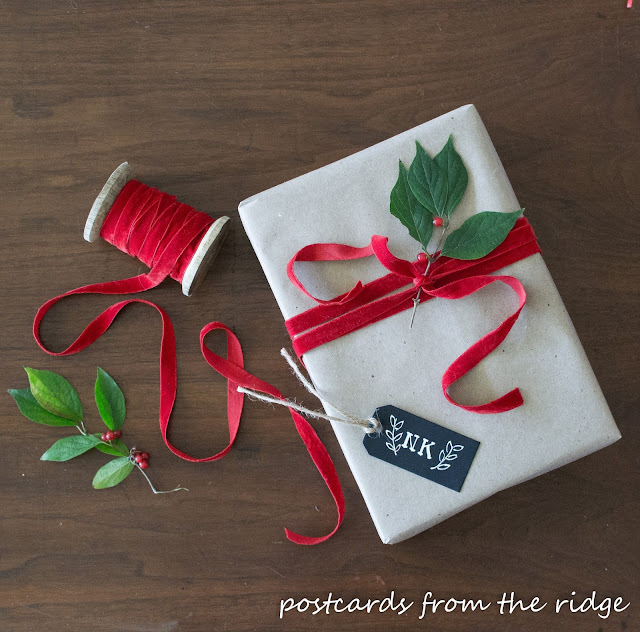 Here I added red velvet ribbon, a branch clipping, and a faux birch gift tag to some kraft paper for a simple yet festive package. The only difference here is the chalkboard gift tag. I used a chalk marker to add initials and added a festive twig. The chalkboard tag makes a little more of a statement than the birch tags, don't you think? I'm seeing red and black buffalo check prints on everything this year. It's perfect for winter and the holidays. 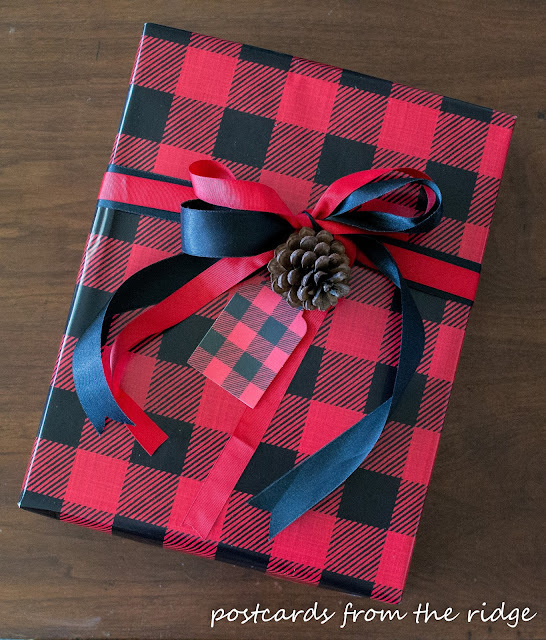 I wrapped this large package with some buffalo check wrapping paper and added some red and black ribbon and a pine cone. A buffalo check gift tag finishes it off. Sheet music can be used on small packages. For this one, I simply removed the staples from the book of sheet music and removed a double page. 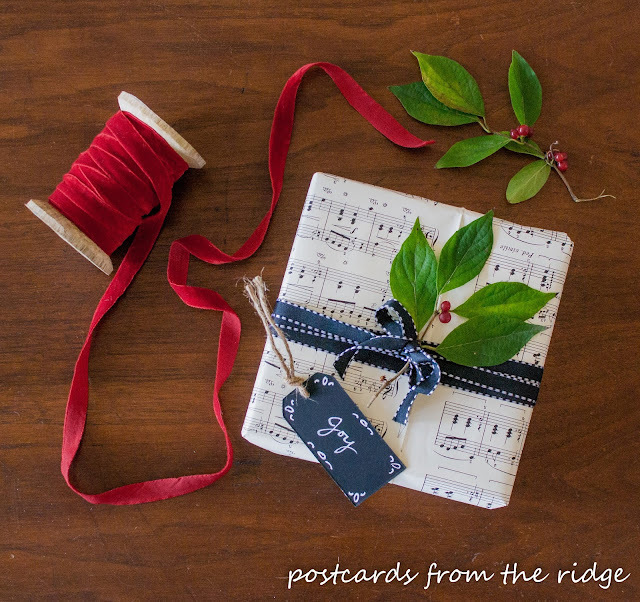 It's finished off with black ribbon, a branch clipping, and another chalkboard tag. And now for a confession and a reality shot...the chalkboard wrapping paper. Don't laugh too hard. 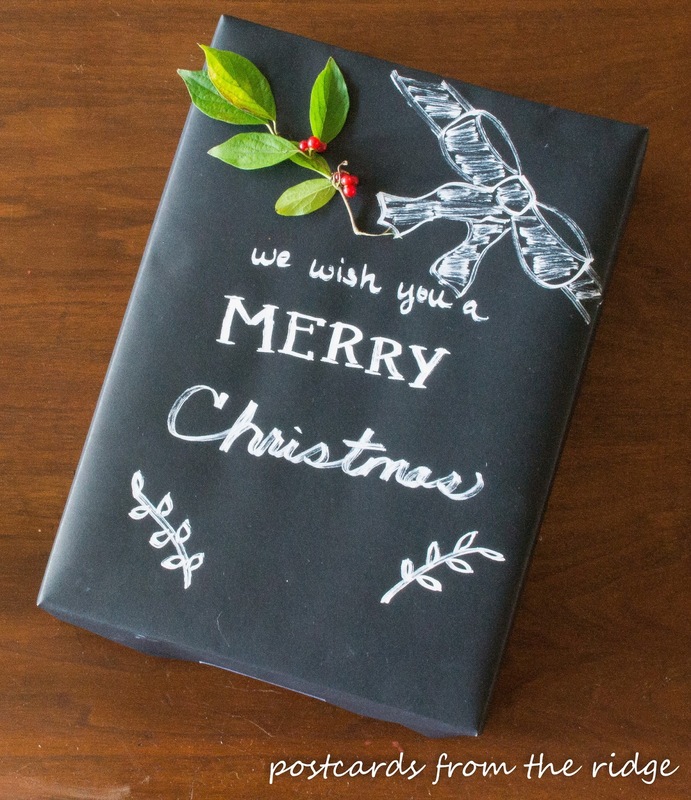 I had seen some beautifully wrapped presents using chalkboard wrapping paper on pinterest. And I don't know how things are for you, but sometimes my pinterest inspired projects look nothing like they're supposed to. It might have something to do with the fact that my artist skills are on a 3-year-old's level. It was fun trying it and I'm sure yours will look better than mine. Next time I'll recruit my daughters to do the chalk writing for me. Now it's time to visit my creative friends' blogs and see the wonderful gift wrap ideas that they're sharing. Prepare to be inspired!! Have you started your shopping yet? The launch of a brand new link party! 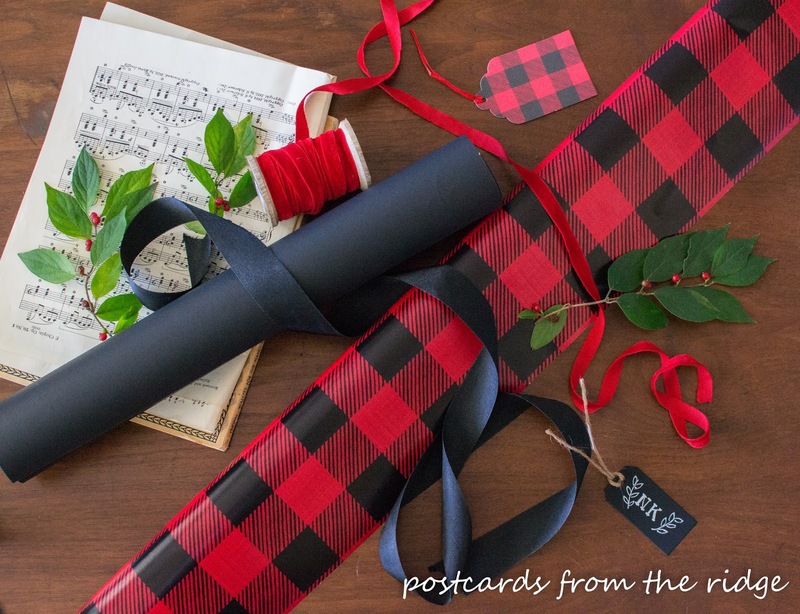 Angie - we LOVE your gift wrap design! You had us at Buffalo check plaid! Your packages are so pretty and creative. And no worries about your chalkboard art - it looks fantastic! Cheers to a happy Season! How creative Angie. I love all the wrapped packages. 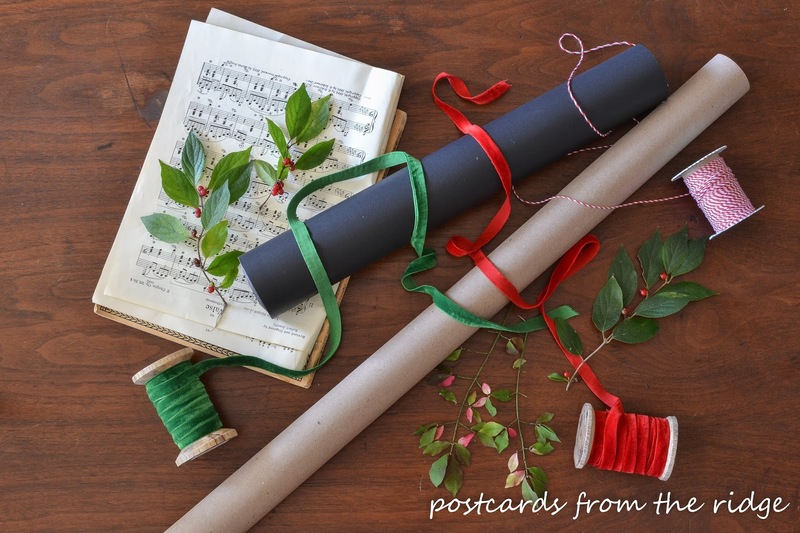 I think my favorites are the sheet music and the chalkboard papers. At first glance I thought the plaid was fabric! Thanks for sharing. All such cute ideas! Thanks for sharing! Wow...love them all. I so love the gorgeous velvet ribbon. Got to get the sheet music paper....what a great idea for that musician on your list. Thanks for all of the inspiration here....great partying with you!! I LOVE all of your packages, Angie! I was totally unaware of chalkboard wrapping paper and tags so thanks for including where I can purchase it!!! And I'm a sucker for pretty velvet ribbon!